Professional quality magician performing stage shows or close up magic for corporate events and private functions. Also available for Trade shows, Product launches, wedding receptions, cocktail parties and gala dinners. Alan is a professional multi-award winning international corporate magician who has been in the magic industry for over 25 years. He has travelled the world with his magic and has performed in Hollywood, Los Angeles California. He has also been the resident magician at various venues, restaurants and theme parks throughout New Zealand offers the world of corporate entertainment. Shows can be tailored to suit your needs. The shows are very interactive and filled with comedy and humour that will leave you and your guests wanting more. Companies are always looking for a way of engaging their employees. Whether it’s an awards night, an year-end meeting or conference, the event should be memorable – and that means some entertainment and laughs needs to be included in the event to be a successful. Hiring a magician gives for a corporate event gives you the best of everything – you get spectacular magic and comedy. The guests will wonder how on earth Alan did he tricks right before their eyes! Corporate entertainment should never be boring so if you want to offer something intriguing to your guests or employees Alan can do that for you. Corporate entertainment and magic go hand in hand. It’s not just for kids at birthday parties – it’s for all who are young at heart! When it comes to corporate entertainment, there are a lot of choices out there. Close up strolling magic is a great way to make guests feel at ease and entertained during the cocktail hour at your function or event. Alan's strolling magic is perfect for cocktail parties or receptions. He performs his magic in the hands of your guests, using cards, coins, jewellery and other magical props. This intimate style of performance allows the flow of the party to move uninterrupted and is an excellent ice breaker. Alan can provide something unique to your event. Comedy and humour keeps everyone at the edge of their seats throughout the entire production. His show is very interactive and is a great time for every guest. Shows vary in length from 30 minutes - 1 hour or can be tailored especially for you to suit your event and timetable. Alan has been producing leads for major companies at trade shows. He knows how to tell a story. He helps you make a lasting impact. He will even show your sales people how to take advantage of the large audience he attracts. Your company benefits with quality leads and orders. Book a half hour show with lots of magic, fun and laughter for your child's birthday. As seen on national television. Alan and his wife Michele are recipients of the prestigious DRAGON Award. It was presented at the Centennial Celebrations of the Society of American Magicians in New York on the 4th of July, 2002 by the previous recipients Paul and Debbie Daniels from England. The DRAGON Award recognises a lifetime achievement by a team in Magic who excels in Drama, Romance, Artistry, Glamour, Originality, and Necromancy. Alan was awarded the Benny for Top Magician from the Variety Artists Club - for four consecutive years. At the Society of American Magicians Convention in Las Vegas, he was appointed International Deputy for New Zealand, by past President, Craig Dickson. In March 1995 The Magic Circle in England presented Alan his M.I.M.C. - Member of the Inner Magic Circle with Gold Star. In April 2001 he was appointed The Magic Circle Representive for New Zealand. A career highlight was being invited in 1987 to perform at the Magic Castle. The late William Larsen, then President of the Castle, wrote, "He delighted our audiences with his unique technical skill. They are at once astonished and well pleased, a rare combination for any professional to master. His act is of the highest quality and he is one of the finest talents to appear at the Magic Castle in a long time." Alan has since been invited back, performing over 100 shows in the Close-up Gallery and Parlour of Prestidigitation at this world famous Hollywood venue. The late J. Marberger Stuart, President of the DRAGON Awards wrote, "Please come to the United States more often. New Zealand should share its star performer with us all. "I can honestly say that I consider you to rank among the top magicians in the world." Press release from Jane Stuart, President The J. Marberger Stuart Foundation, Inc. - 2002 DRAGON Award]. Alan has regularly performed overseas, winning many international awards. 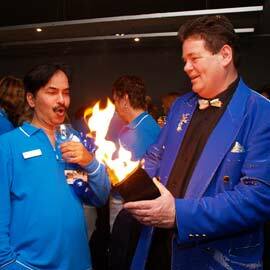 He has assisted many international magicians with lecture tours here in New Zealand. He is also the editor of for magicians which has 10,000+ subscribers from 75 countries. That growth has now made it possible to sponsor lecture tours of some of the world's top magicians around the country. Thank you very much for your wonderful performance of strolling magic at the Parkroyal on St. Kilda Road. Your professionalism and entertaining talents excelled with both our weekly cocktail party and our corporate function. I very much look forward to your returning to Melbourne and particularly to the Parkroyal on St Kilda Road where we may be able to have you perform again in our functions. I would like to express my thanks to you for the two performances of close-up magic you carried out here at the Travelodge. Both occasions were very successful with many of our guests commenting on your flair and talent. I was especially pleased with the atmosphere you created in our outlets as you wandered from venue to venue. It certainly added a touch of sparkle and wonderment to our guests' evening, and many of our regulars are still commenting upon it. Again Alan, many thanks for your efforts and I look forward to welcoming you back to the St Kilda Travelodge in the future. I just want to thank you for the fabulous performances you gave at our Hunchback of Notre Dame presentation at the Aotea Centre. Your performances added a great creative dimension to our presentation and I found you to be a dependable and reliable person to work with. What a great performance you put on last night at the Variety Artists Club. I was totally mesmerized along with the entire audience. I can see why you are so well respected by your international peers and considered a Master of Magic. My lips are not sealed when I say, "In my eyes you are New Zealand's greatest magician".